This is just posturing. Don’t let it intimidate you! We’re a month into the winter program at Berkshire Nautilus (42 Summer St, Pittsfield). A regular crew of people, gathering at 6-7 AM on Tuesdays and Thursdays, and at 7:30-8:30 AM on Saturdays, is racking up meters on our twelve ergs. But for some people, a winter-long commitment to a program like this isn’t possible. For such as these, dropping in for camaraderie, coaching, and a challenge from time to time might sound perfect. For just $15 a pop, here’s how you can now take part. Go to Regatta Central and sign into your account. Go to the Reservations link. You’ll see all our shells listed. Change the Category field by clicking the down arrow next to Shells and selecting Ergs. Reserve one of the remaining ergs for the next day at the specified time. 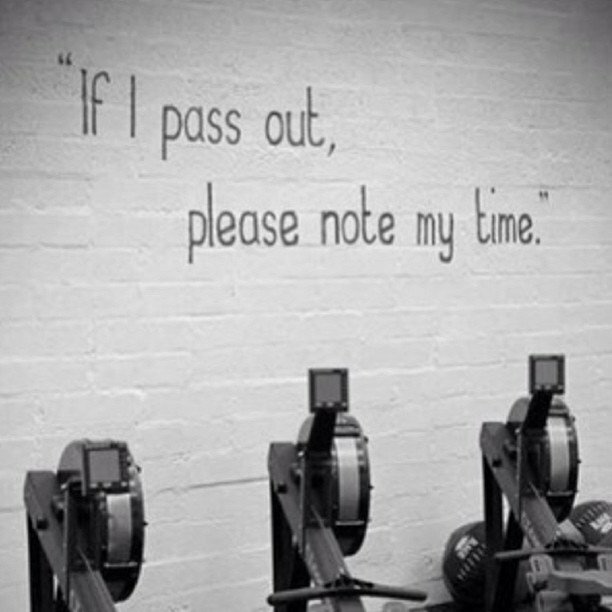 You should do this to make sure there’s an erg available to you – just like at the lake. Then click the Back arrow on your browser to go to the home page. Click Programs > Berkshire > Equipment Usage. NEXT – for first-timers, show up early for the class. You will also have to fill out their application and waiver which will take 5-10 minutes. Then, pay Nautilus $10 for a day pass (it’s normally $15, but they gave us a deal). Come upstairs and grab an erg! Connell, the mind behind the program, says, “I look forward to seeing you at the gym.” Don’t let him down!